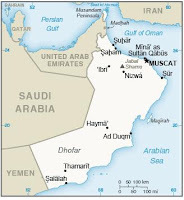 Oman hasn't reported a MERS case since the end of May, 2015 (see Oman Reports 6th MERS Case), but was also the apparent source of Thailand's first imported MERS case last June (see Thailand Reports 1st MERS Case (Updated)), introduced to the country via an Omani business man seeking medical treatment. The true incidence of MERS in the Middle East is unknown, as some cases are mild (or even asymptomatic), and only those sick enough to be hospitalized (and tested) are ever announced. Today Oman's Ministry of Health has announced their 7th official case. The Ministry of Health announced today (Monday) for the diagnosis of new cases of AIDS Middle East acute respiratory known disease Coruna is this case is the seventh of the total cases reported in the Sultanate where they were the previous case in the month of May 2015 diagnosis, this case of a patient in his forties suffer from a severe inflammation in the lung and a rise in temperature, and his condition is currently stable and have good care in one of the referral hospitals. The ministry confirms the continuation of its efforts to monitor and control the disease through effective epidemiological surveillance system in place and the readiness of all referral hospitals to deal with such cases, while the Ministry of Health with other relevant actors proceed with health and preventive action. The ministry calls on all segments of the society of citizens and residents alike need their cooperation in order to follow the advice and guidance to effectively contribute to overcome a lot of infections and health problems including respiratory diseases and foremost of which is to maintain personal hygiene and cleanliness of hands and follow proper health behaviors when you cough and sneezing. Although MERS activity has been subdued the past couple of months, 2015 was nonetheless a very active year for the virus, causing several very high profile outbreaks in Saudi Arabia, South Korea, and Jordan. 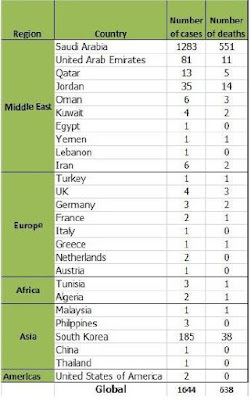 The official MERS count (by country) from the ECDC as of the end of 2015 shows Oman ranked as #6 in the number of reported cases, although imported cases aren't always attributed to the (likely) country of origin.